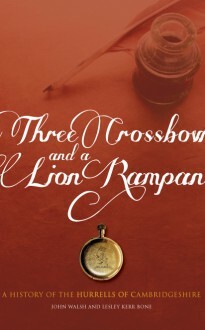 This unusual book describes a history, covering four centuries, of a line of Hurrell families, linked together under the family coat of arms of three crossbows and a lion rampant. The family line is first encountered in the Essex village of Sible Hedingham in the 1500s, and is then followed through Cambridgeshire to London and Zimbabwe, formerly Southern Rhodesia. Major William Hurrell emigrated to South Africa in 1877 as a young man, and had the crest from the coat of arms engraved on his fob watch, now in the care of John Walsh. John and his niece, Major Lesley Kerr Bone, both descendants of Major Hurrell, have collaborated to write this fascinating history. John Walsh read Forestry at Oxford and practised both in Zambia and in Tasmania. Now retired, he lives in Hobart, with his wife Doreen. He has a life-long interest in history, both general and that of his forbears. However, having listened to recollections about his family’s past, he decided that there were facts that needed to be explored and details that required proof. So when he discovered that Lesley Bone also had a deep interest in the history of the Hurrell family, the project was launched. Lesley had the advantage of a lifetime spent developing her genealogical skills, and tenacity of purpose that comes with a career as an officer in the army reserve. She carried out most of the research for this project, which at all times has been backed up by accurate historical and factual evidence. Living in London, she was well placed to make use of the extensive records of births, marriages, deaths, wills, census returns and other documentation. All this has combined to make a very detailed, interesting and easily read record of one line of a family through various historical settings and events.